Members of Las Cafeteras perform an updated version of "La Bamba." Anthems are curious things. There are the songs that each country is given to represent and sometimes unite its citizens. But other songs pop up and unite a specific subset of citizens. Songs that most often come from popular music tap into a collective energy to represent such disparate causes — from a soccer fight song to a melody that offers solace or inspiration. These are the themes of NPR's year-long American Anthem series. We share some of these stories this week. 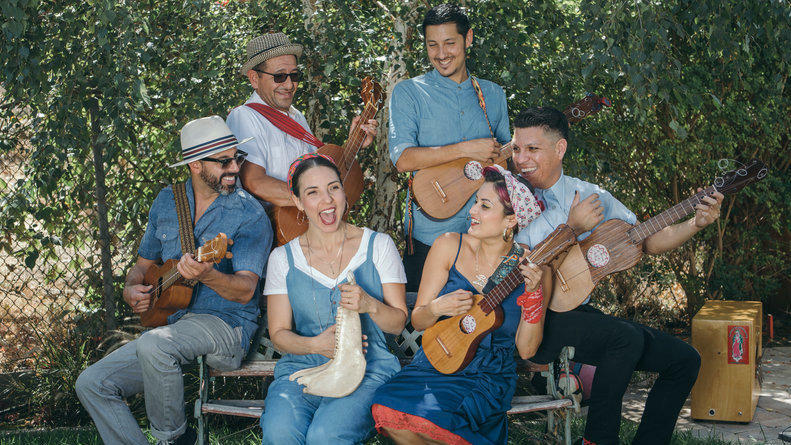 We've pulled aside some fine reporting about music that speaks to what we do here on Alt.Latino, specifically a deeper dive into a folkloric classic "La Bamba" and a Chicano civil rights-era pop song that has had a huge long tail of influence. There are plenty of other thought-provoking stories on the show this week that we are proud to offer as part of NPR's commitment to representing the essence of America and the word 'public' that's in our name. Enjoy the journeys.